Brief Synopsis – A platoon of soldiers land in Italy during World War II and must try to reach their objective and blow up a key bridge. My Take on it – This is a film that I heard about years ago, but never got around to seeing what it was all about. 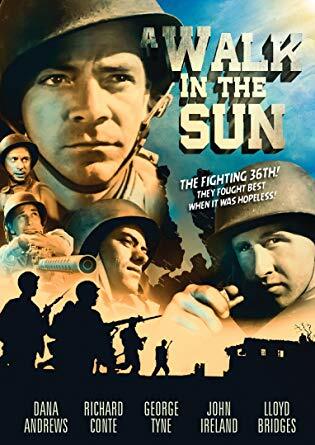 They do a wonderful job here showing the hardships of men during war but at the same time they show how the friendships and camaraderie forged in these situations also helps them fulfill their duties along the way. The characters are developed really well especially when we get to see them having normal kinds of conversations as they move from place to place. This helps us see the very diverse nature of the platoon and we can see how the different upbringings of some of those men leads to clashes that both help and hinder things as they move along towards their objective. We are given a very clear idea of who each of these men are and how in the cog of war, each of them has an important part in the system. The cast of this film is also great and we get some very recognizable actors in key roles. Loved the fact that even though they introduce us to each of the characters individually at the start of the film that doesn’t give any of them any sort of immunity along the way and it helps keep things realistic in the way that wars are fought, won and lost. Bottom Line – Great war film that shows the hardships of war yet at the same time the camaraderie of the men as they try and do their duty. They show quite well the diversity of the soldiers in the platoon and we get to see how the clash of some of their upbringings actually help sometimes while it hinders in other situations along the way. We get a clear idea of who each of these men are and how important a cog each of them is in the system. The cast is great and there are some very recognizable actors in the film but that doesn’t mean that they will all find a way to make it to the very end. Recommended!